So Bushiroad is determined to make Demiurge actually be worth something. AUTO: [Choose 1 card from your hand, dsicard it] Whjn this card is placed on (VC), you can pay the cost. If you pay it, reveal the top 3 cards of your Deck, and choose up to 2 <Gear Colossus> or <Zodiac Time Beast> among them, add 1 of them to your hand, bind the other face-up, and place the remaining cards into the Drop Zone. AUTO (VC): When your G Unit [Stride]s, you can draw 1 card. If you draw it, choose 1 card from your hand, Bind it face-up, choose 1 of your Vanguards, for each of your cards in the Bind Zone, during that turn, it gains Power+1000. AUTO (RC): [Choose 1 Grade 3 <Gear Colossus> from your hand, Reveal it] When your Ride Phase begins, you can pay the cost. If you pay it, Bind the top card of your Deck face-up. ACT (RC) Generation Break 1: [Soul Blast 1 & Retire this Unit] If you have a <Gear Colossus> Vanguard, Bind the top card of your Deck face-up, or if that card is a <Zodiac Time Beast>, draw 1 card. For Today’s Card we’re introducing the following cards from the 11th Booster “Rogue Deity Descent” (on sale June 9th, 2017 for Japan): The 《Gear Chronice》 “Deus ex Machina, Demiurge” Support Cards: “Pulsar, Drastic Colossus” and “Pulsar, Sentry Dracokid”. “Pulsar, Drastic Colossus” has good affinity with “Idea-drone” cards like “Kaigomai Idea-drone”, and it’s a Grade 3 Unit that has both the races of 〈Zodiac Time Beast〉 and 〈Gear Colossus〉. When it’s placed on the Vanguard Circle, you can reveal the top 3 cards of your Deck and choose 2 〈Zodiac Time Beast〉 or 〈Gear Colossus〉 among them, add 1 of them to the hand, Bind another, and place the remaining into the Drop Zone. With this, it supports the condition of binding 12 cards for “Deus ex Machina, Demiurge”. Also, its Stride ability lets you Draw 1 card and then Bind 1 card from your hand. And for each of your Bound Cards, your Vanguard gains Power+1000. Meaning the Guard restricting attack of “Deus ex Machina, Demiurge” becomes even more powerful. 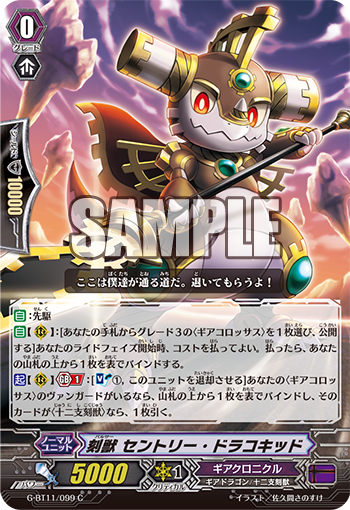 Continuing, we introduce the First Vanguard “Pulsar, Sentry Dracokid”, a Unit that lets you Bind a card every turn. When your Ride Phase begins, you can reveal a Grade 3 〈Gear Colossus〉 from your hand to Bind the top card of your Deck face-up. If you reveal the above-introduced “Pulsar, Drastic Colossus” or “Prospatheia Idea-drone”, you can essentially send cards to your Bind Zone each turn without really paying a cost. And once you’ve achieved Generation Break 1, if you have a 〈Gear Colossus〉 Vanguard, you can Retire this card to Bind the top card of your Deck, if if it’s a 〈Zodiac Time Beast〉, you can draw 1 card. In a Deck with many 〈Zodiac Time Beast〉 cards, you’ll be able to activate the ability of “Deus ex Machina, Demiurge”. “Rogue Deity Descent” has many outstanding 〈Zodiac Time Beast〉 cards included, so enjoy the challenge of building a Deck that unifies the 〈Zodiac Time Beast〉! For the foreseeable future we’re going to be introducing cards from the 11th Booster “Rogue Deity Descent”. Please enjoy! ← Shadow Paladin Retrospective, Part 2: By Any Means Necessary!